Alastair Stott, general manager for client and guide dog services at GDV, described the project, which is still in its preliminary stages, as building a “voice- and AI-enabled platform for peer support”. “It’s difficult for people with low vision to access information online, so we’re looking to develop a voice and AI-enabled platform that allows them to connect with their peers and access information again to support them to become more independent and less socially isolated,” he told Computerworld. Like Apple’s Siri voice-based assistant for iOS, users will be able to ask questions and get information delivered back to them. Funding from a National Disability Insurance Agency grant will be used to develop a prototype over the next two years. The plan is to use combine already existing technology with content relevant for low-vision people. “It’s not a technology project as such; it’s actually about taking existing technology and applying it in a way that is particularly useful for people with low vision,” Stott explained. The project has already sparked interest among potential technology partners but GDV is yet to narrow in on the components it will be based on. The fruit of the recent collaboration with ThoughtWorks is the SensaCane, which Stott said GDV is seeking to put into commercial production. 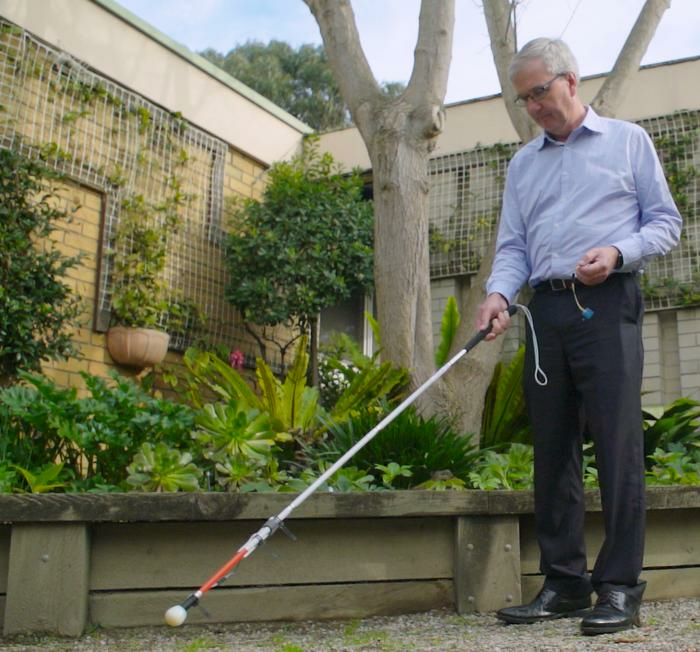 In the space of a five-week co-design-driven project, the two organisations worked together to develop a prototype of the device, which offers a significant safety boost for low-vision and blind cane users. “One of the great challenges for people with low vision or blindness — even people who are experienced cane users — is crossing wide and, particularly, offset intersections,” Stott said. If an intersection is offset, it’s very easy to veer off-course — and potentially into traffic. “It’s a problem that’s been around for as long as there’s been people with canes trying to cross roads,” Stott said. Over the space of a little over a moth, ThoughtWorks led an iterative co-design process that saw GDV and its clients trial a number of different solutions. The SensaCane was the best-performing, Stott said. The system uses an optical sensor attached to the end of a cane that can detect when a user is starting to cross a road marking. It will then wirelessly send a signal back to the user, causing a wrist band to vibrate and alert them to the danger. Initially the system relied on sending a vibration up through the cane — however, the feedback from users was that it was not always detectable because of the vibrations from the cane moving across the road surface. The shift from vibrating cane to delivering haptic feedback through the wristband is an example of the “highly agile, highly iterative” development process used during the project, Stott said. The SensaCane was not the only approach trialled during the project; in total, four prototypes were developed by ThoughtWorks. The other solutions were a computer vision app that detected where the lines in an intersection were and then delivered voice guidance, a machine learning based app that learned from different intersections and anticipated the best way to cross a road, and a solution relying on wireless beacons to provide guidance. The SensaCane approach, despite its relative simplicity, delivered the best results, Stott said. The other prototypes could potentially feed into other applications, however, he added. Early in the project, GDV staff gave the ThoughtWorks team first-hand experience of the problem they were tackling, taking them up to Heidelberg Road in Kew, blindfolding them and setting them off across an intersection equipped with a cane (“We obviously had someone standing closely behind them!” Stott quickly notes). Working alongside a handful of ThoughtWorks employees, who were also able to draw on a development team in China, were a group of GDV clients to help evaluate each iteration of each solution. “That was really valuable because they were able to get that immediate feedback,” Stott said. New versions of the prototype apps were produced overnight, ready for testing the next day. “So it was a highly agile, highly iterative, very strongly co-designed process that enabled us, in such a short time, to not only come up with the four solutions but then be very confident that we’d selected the best one to move forward with,” he said. GDV is currently seeking investors and potential distribution partners for the SensaCane. The next step will be developing an engineering prototype. “There’s 285 million people with low vision and blindness around the world,” Stott said.